When you look at iOS, you’re looking at a user interface more than an operating system. Beneath the animations, transparencies and rounded-corner icons is the core of the operating system… basically, a bunch of ASCII text, similar to a Terminal window, that is what iOS looks like before it puts its face on. 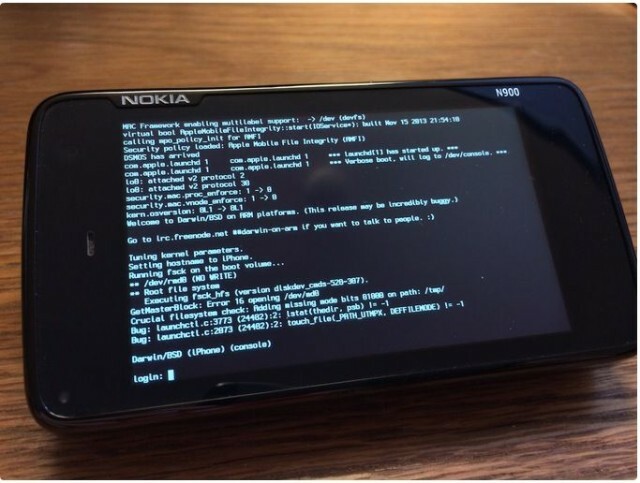 In a rather interesting twitch, Winocm — one of the hackers behind the iH8Snow iOS 6.1.3/6.1.4 jailbreak — has managed to get iOS’s core running on a Nokia n900 smartphone. Reecently, I achieved one of the core milestones of my personal project, porting the Darwin kernel to the ARM architecture. This specified milestone was booting to a multiuser system. Darwin is the core operating system that lies under both Mac OS X and iPhone OS. It is the true core foundation that bridges the kernel to the actual UI above. (SpringBoard/loginwindow/etc). It would be nice if this work ever saw a widescale release, but don’t get your hopes up. Just because a hacker can inject code into a device with great pain and deliberation doesn’t mean that a port that runs iOS on any mobile device will ever be a double-click-to-install affair. And considering that similar hacks like this have never been released, I wouldn’t hold your breath.